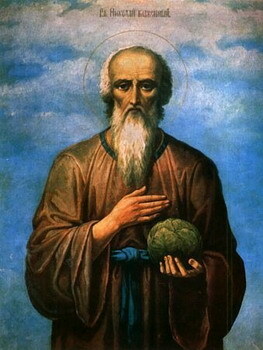 Blessed Theodore of Novgorod was the son of pious parents, wealthy citizens of Novgorod. Having been raised in strict Christian piety, and having reached the age of maturity, he took on himself the ascetic deed of foolishness for Christ's sake. He gave all his possessions to the poor, and he lived in great poverty until the end of his life, not even having a roof over his head, nor warm clothes on cold days. The blessed one possessed the gift of clairvoyance. By warning people to see to their bread, he was actually predicting an impending famine. Another time he said, "This will be bare, it will be fine for sowing turnips." This was his prediction of a fire that devastated the streets of the Torgov quarter. Blessed Theodore foresaw his own end and said to the Novgorod people, "Farewell, I'm going far away."